Regardless of the details, skeptics have little patience for such notions of conscience—much less the idea of the Absolute. They are perpetually vigilant lest some confederacy of self-satisfied prigs attempt to impose their will on everyone else by dressing up their particular desires in the garb of the universal and presenting them to the public as the dictates morality. This is not an unreasonable fear and a healthy skepticism is, perhaps, an appropriate response to most moralistic rhetoric. What is so beautifully elegant about the general notion of conscience that we derive from Kant and Heidegger, however, is the fundamental element of autonomy. Because we distinguish between the call of conscience (which we associate with our Divine Essence) and socially conditioned guilt (which we associate with our super ego), we must acknowledge that one person cannot ultimately judge whether or not another person is following the call of conscience. All we can ask of people is that they listen up—stressing, at this point, that there is a relationship which gives life meaning and purpose and a call that ought not be ignored. We are certainly free to disparage the possibility of such a relationship and we are free to simply ignore the call, but it is our choice— our intention —that ultimately determines the phenomena and not vice-versa. 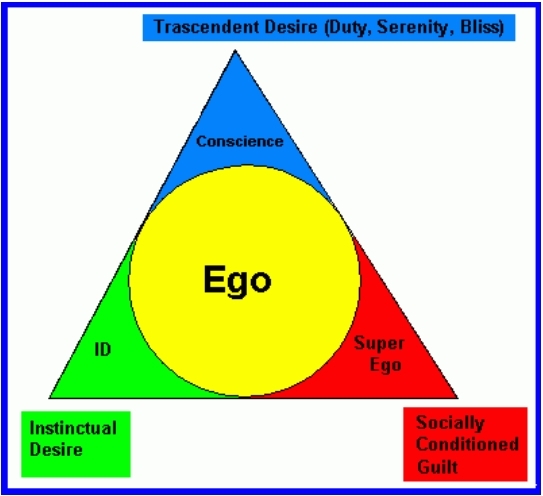 If we abstract from the top of the first diagram, above, all we are left with is the tension between our own instinctual desires and the desires and expectations of others which we have, to some degree, internalized. The dynamics of this tension is aptly described by Freud as Civilization and its Discontents and by Nietzsche as The Will to Power. 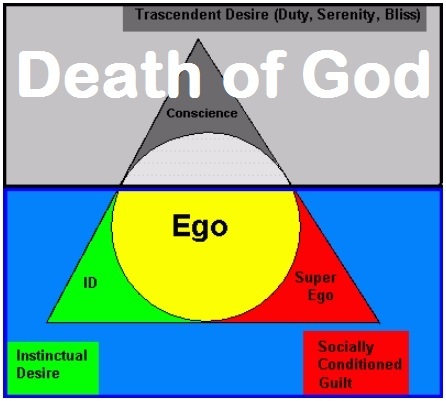 Both Freud and Nietzsche have radically called into question the perspective illustrated by the first diagram. But even if its reality cannot be demonstrated to those who refuse to listen to reason, it remains a viable option to people of good will. The first diagram illustrates the perspective of faith while the second diagram illustrates the perspective of despair. The choice is always ours.